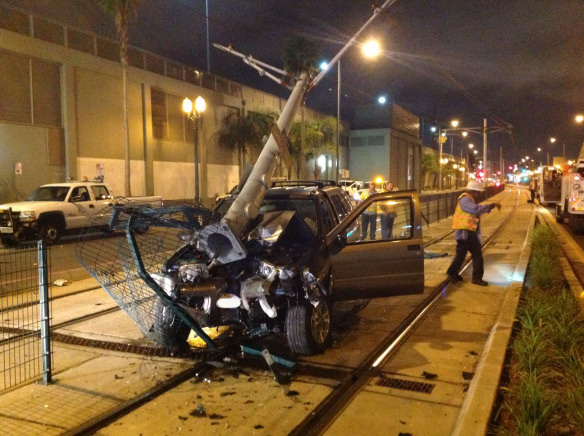 Suspected drunk driver crashes into Expo Line power pole and damages overhead wires. More than 13 million Californians will be traveling this holiday season. That puts roughly a third of the state's population at risk they for encountering impaired driving or even doing it themselves. On Tuesday, the Auto Club of Southern California is holding something called the 4D Summit in downtown LA. It's a day-long discussion looking at the latest research into drugged, distracted, drowsy and drunk driving. Doug Shupe is a spokesman for the Auto Club of Southern California. He joined Take Two's Meghan McCarty Carino to talk about the different types of impairment, including drugged driving -- a major focus for the 4D Summit. Traffic safety experts expect an increase in drugged driving once the legal sale of recreational marijuana begins in California on January 1. "People must know that getting behind the wheel after ingesting or smoking marijuana is still illegal and it is very dangerous," Shupe said. "And also a very alarming recent survey by the Colorado Department of Transportation found that 55 percent of people surveyed said they believed it was safe to drive under the influence of marijuana. The same percentage of people -- about 55 percent in the survey -- also said they had driven high about a dozen times within the last month in Colorado. We don't want that happening here on our roadways in California." Is California falling short in preventing drunk driving? Tuesday Reviewsday: Inara George, the Reverend Shawn Amos and Ella Fitzgerald.